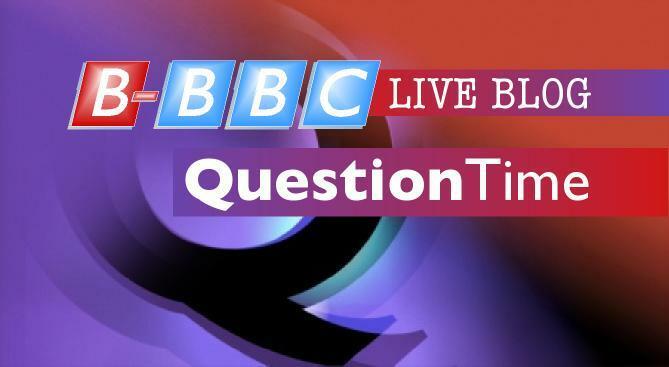 Tonight Question Time comes from King’s Lynn (Coat of Arms Motto: “I can’t read or write, but I can drive a tractor”). The arrival of the BBC moving-picture machine demoncraft has been reported widely in the local newspaper – which is published fortnightly to warn the locals of upcoming full moons, new roads and immigrants, as well as providing the timetables for witch burning. On the panel: Universities Minister David “Two Brains” Willetts and the world’s most unsuccessful bulimic John Prescott. To be fair it’s been at least 2 or 3 weeks since the leader of the Green Party Caroline Lucas has added her lentil knitting stupidity to Question Time so the BBC have decided that she’s due another shot tonight. The painfully unamusing”comedian” Griff Rhys Jones (whose appearance screams out for an urgent phone order to Slick Mario’s Quick Lime, Tin Bath and Shovel Emporium) rounds off the panel alongside Sunday Times columnist Minette Marrin. There’s a short video by advertising executive Sir Martin Sorrell complaining about red tape strangling growth who will then debate it with Michael Portillo and Alan Johnson. The Guardian’s Nick Watt will join a This Week torch relay as an embarrassing dressing up exercise for the political stories of the week review slot and then …well… Kerry Katona to talk about how she used to get whacked out of her head on cocaine but is better now. Maybe they’ll show some of her old “glamour” photos too? Hopefully not. Join us for the LiveChat. If you dare. OOh Minette be still my beating heart…GRJ has come out against wind farms though, according to Delingpole.